You can keep track of when records in an Access table are last modified, by using a form with a macro. When the form is used to modify a record, the macro stores the date and time in the table. Only the most recent modification date and time are stored. Note: The procedures in this article are for use in desktop Access databases. Tip: If you want to keep track of when records are created but do not care when they are modified, just create a field in the table to track and use the field's Default Value property to timestamp each record when it is created. Users must enable macros in the database. If a user opens the database and does not enable macros, the macro will not time-stamp the records. If you store the database in a trusted location, macros are automatically enabled. If a user edits records, but does not use a data-entry form that contains the macro that time-stamps records, the records that the user edits will not be time-stamped. Because the date and time are stored in table fields, the values in those fields get overwritten every time that a record is modified. In other words, you can only store the date and time of the most recent modification. If you only want to capture the date and time that a record is created, just add a field to the table and set that field's Default Value property to Now() or Date(). If your database file has an older file format and uses user-level security, you must have permissions to change the design of the table and the forms that are used to edit its records. In the macro window, open the macro action list and select SetValue. 1. First, show all available macro actions. The SetValue action is considered potentially unsafe and is hidden by default, because it can change data. 2. Then, select the SetValue action from this list. In the SetValue action box, in the Item box, type or paste [Date Modified]. Open the next macro action list and select SetValue. In the SetValue action box, in the Item box, type or paste [Time Modified]. On the property sheet, make sure that the Selection Type is set to Form. 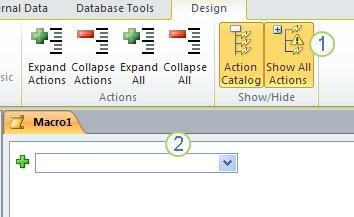 Tip: To change the Selection Type, click the selection type you want in the drop-down list.